and DTP Operator (Desktop Publishing). Total available vacancies in HARTRON Recruitment are 80 posts at different district offices. Interested candidates can download the prescribed application from and instructions to fill the application from the official website http://hartron.org.in. Last date for submission of application along with application fee of Rs. 354/- is 15-11-2017. Selection of candidates is based on written test and Programming/ Practical Test. Selection test will be held at Panchkula. Date and time of Selection test will be uploaded on the HARTRON website by 20-11-2017. 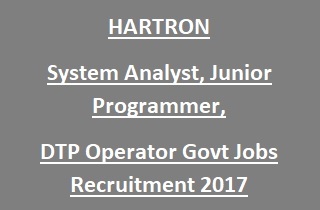 For more details of application fee, Selection process, Selection test details, Exam Pattern, Age limits, Pay scale of Haryana State Electronics Development Corporation Limited HARTRON System Analyst, Programmer, DTP Operator jobs Recruitment 2017 are mentioned below. Total available vacancies in Haryana State Electronics Development Corporation Limited HARTRON Recruitment are 80 posts. Total no of vacancies: 80 posts. -DTP Operator (Desktop Publishing): 05 posts. For district wise vacancies, see the Notification. System Analyst: B.E/ B.Tech in any discipline/ MSc in Computer Science/ ITI or MCA/ B/ C level course from DOE/ NIELIT. Junior Programmer: Graduation with PGDCA/ PDCA/ APGDCA/ PGDIT from recognized University (OR) BCA/ BSc/ MCA/ MSc/ B.Tech in relevant stream (OR) Diploma in Computer applications. DTP Operators: 10+2 with one year course in Desktop Publishing or Graduation with six months certificate course (Full time) in Desktop Publishing. Age of the candidate and relaxations admissible as per rules. DTP Operators: Rs. 18,225/- per month plus Rs. 500/- for Medical. Junior Programmer, Web Designer: Rs. 20,250/- per month plus Rs. 500/- for Medical. System Analyst: Rs. 37,800/- plus Rs. 500/- for Medical. Networking Engineer, Programmer: Rs. 25,200/- plus Rs. 500/- for Medical. Candidates will be selected for HARTRON Recruitment is based on written test and Programming/ Practical Test. Examination consists of 2 parts. 1st Part: consists of 50 MCQ questions. Time duration is 25 minutes. Minimum qualifying marks are 25. 2nd Part (Programming/ Practical Test): Time duration for this test is 90 minutes. Minimum qualifying marks are 50% marks. 1st Part: consists of 30 MCQ questions. Time duration is 15 minutes. Minimum qualifying marks are 10. 2nd Part (Practical Test): Time duration for this test is 60 minutes. Minimum qualifying marks are 50% marks. Sample Papers are available on website. Date and time of the test will be uploaded on the website by 20-11-2017. Application fee for all category candidates is Rs. 354/- in favor of Hartron Informatics Limited payable at Chandigarh. Eligible/ Interested candidates download the application for relevant posts through the official website http://hartron.org.in. Applicants are allowed to send only one application for one category. Fill the application with all details. Last date for submission of complete application with application fee is 15-11-2017.